Sweet basil (Ocimum basilicum) has multiple cultivars, of which Thai basil, O. basilicum var. thyrsiflora, is one variety. 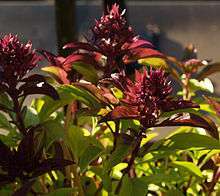 Thai basil itself has multiple cultivars. One cultivar commonly grown in the United States is 'Siam Queen'. Thai basil may sometimes be called anise basil or licorice basil, in reference to its anise- and licorice-like scent and taste, but it is different from the Western strains bearing these same names. 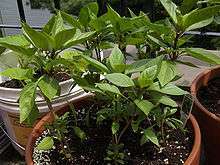 :92 Occasionally, Thai basil may also be called cinnamon basil, which is also its literal name in Vietnamese, but cinnamon basil typically refers to a separate cultivar of basil. The genus name Ocimum is derived from the Greek word meaning "to smell", which is appropriate for most members of the plant family Lamiaceae, also known as the mint family. With over 40 cultivars of basil, this abundance of flavors, aromas, and colors leads to confusion when identifying specific cultivars. Three types of basil are commonly used in Thai cuisine. First, Thai basil, or horapha (Thai: โหระพา), is widely used throughout Southeast Asia and plays a prominent role in Vietnamese cuisine. It is also the cultivar most often used for Asian cooking in Western kitchens. Second, holy basil (O. tenuiflorum), or kaphrao (Thai: กะเพรา), which has a spicy, peppery, clove-like taste, may be the basil Thai people love most. :93 Holy basil is also known as Thai holy basil or by its Indian name, tulasi or tulsi; it is widely used in India for culinary, medicinal, and religious purposes. Finally, lemon basil (O. × citriodorum), or maenglak (Thai: แมงลัก), as its name implies, has undertones of lemon in both scent and taste. Lemon basil is the least commonly used type of basil in Thailand. :94 It is also known as Thai lemon basil, in contradistinction to Mrs. Burns lemon basil, another cultivar of basil. 1 2 Simon, James E.; Morales, Mario R.; Phippen, Winthrop B.; Vieira, Roberto Fontes; Hao, Zhigang (1999). Janick, Jules, ed. "Basil: A Source of Aroma Compounds and a Popular Culinary and Ornamental Herb". Perspectives on New Crops and New Uses. Alexandria, VA: ASHS Press: 499–505. 1 2 3 4 Loha-Unchit, Kasma (1995). "Garden Herbs". It Rains Fishes: Legends, Traditions and the Joys of Thai Cooking. Pomegranate Artbooks. ISBN 0876543565. OCLC 31865230. ↑ "Classification for Kingdom Plantae Down to Species Ocimum basilicum L.". Natural Resources Conservation Service. United States Department of Agriculture. Retrieved 11 April 2011. ↑ Loha-unchit, Kasma (1995). "Holy Basil – Bai Gkaprow". Thai Food & Travel. Retrieved 11 April 2011. ↑ Raghavan, Susheela (2007). Handbook of Spices, Seasonings, and Flavorings (2nd ed.). Boca Raton, FL: CRC Press. p. 72. ISBN 9780849328428. Retrieved 8 December 2014. ↑ "LAMIACEAE (formerly LABIATAE) - The Mint Family". The Seed Site. Retrieved 11 April 2011. 1 2 Meyers, Michele (2003). Basil: An Herb Society of America Guide (PDF). The Herb Society of America. p. 32. Retrieved 8 December 2014. ↑ Brissenden, Rosemary (2003). Southeast Asian Food: Classic and Modern Dishes from Indonesia, Malaysia, Singapore, Thailand, Laos, Cambodia and Vietnam. Singapore: Periplus Editions. p. 34. ISBN 9780794604882. Retrieved 8 December 2014. 1 2 "Basil, Thai Basil, Organic". Seedaholic.com. Retrieved 8 December 2014. ↑ Andrews, A.J. "How to Plant Thai Basil". SFGate Home Guides. Retrieved 8 December 2014.